Five great tips for those of you who do craft shows, plus one thing NOT to do. Go dark. Dark surfaces show off most jewelry well – just make sure to keep them lint free! Avoid patterned cloth – your lovely designs will get lost. 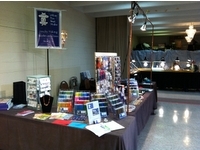 Your table covers should reach the floor – then you can hide all your tote boxes under the tables during the show and keep your display space nice and neat. Go light. Lighting is critical – halogen lights make jewelry sparkle, which helps it sell. They get hot, though, so be sure to keep them a safe distance from your shoppers, and mount them securely. Take names. Every show you do is an opportunity to build your customer mailing list – this list is a valuable asset which will grow as you grow your business. Make sure you give all visitors to your booth the opportunity to continue a relationship with you beyond the show. Protect that asset by keeping your promise to keep it private. Be prepared. Keep a show kit – mine has pens, tie straps, duct tape, binder clips, tissues, scissors, a couple of tools, bags, and more. Also essential are receipt books, calculator, credit card machine, merchandise bags and anything else you need to complete transactions. Extra extension cords and tablecloths come in handy, as well as bottled water, energy bars and healthy snacks. Be available. What NOT to bring? A magazine or book. Even the slowest, most boring show should find you “on” and ready to engage with any customer who walks by. I like to bring a project to work on – that’s a great way to get someone to walk over and get interested. No customers? Now is the time to talk to other vendors and exchange ideas – network! Do you have a great tip for shows you’d like to share? Post a comment here today!